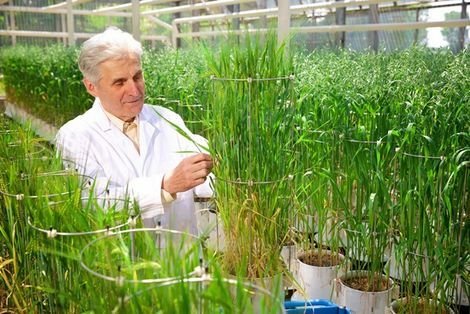 An interview with Prof. Dr. Dr. h.c. Hans-Joachim Niclas – an agricultural chemist, who combines academic teaching and industrial research, in the German federal state of Saxony Anhalt. Prime Minister Dr. Reiner Haseloff, recently awarded the 75-year-old chemist Dr. Dr. h.c. Hans-Joachim Niclas with the badge of honour of the state of Saxony Anhalt, for his extraordinary services. The prize winner gave the following interview about Professor Niclas’ professional career, and his contribution to the innovative product portfolio of SKW Stickstoffwerke Piesteritz. Prof. Niclas, what was the trigger for you, to study chemistry, just a few years after the end of the war in Berlin? Even as a school pupil, I was already interested in natural sciences, particularly biology. When I was finally faced with choosing a degree in 1959, my teacher warned me to consider it carefully. Because, if I chose biology, he said ironically, the best I could hope for was to become Zoo Director, and it is well known that there are a limited number of Zoo Directors! At this time, I heard that chemists were needed. “Chemistry gives bread, prosperity and beauty“, is what they were saying at the time, in the difficult post war years, when most people didn’t have enough to eat. Didn’t your family already have a tendency towards agriculture? Yes absolutely. I grew up with agriculture. My father was a farmer and beer brewer. At the time however, modern organic and environmental chemistry as we know them today, did not yet play any role in agriculture. Agriculture was not the reason why I chose to study chemistry. It was much more about my general interest in natural sciences. You were a very good student and became an even more successful natural scientist, who has developed 123 patents up til now. Do you still remember your first patent? Of course. As a young graduate and employee of the Central Institute for Organic Chemistry of the Academy of Sciences of the GDR in Berlin-Adlershof, I wanted to complete my doctorate as quickly as possible. My doctoral thesis, part of which then lead to the patent, was about the topic of plant protection, in the scope of an industrial doctoral programme at Fahlberg-List. You see, even this “start” was built on “agricultural land”. After longstanding roles at the Academy of Sciences, a new phase of your professional life began in 1997. At the age of 56, you became Head of the Research and Development Department of SKW Piesteritz. How would you rate this new start today? SKW Stickstoffwerke Piesteritz GmbH was founded in 1993. My start as Head of Research and Development in the company just four years later, happened at a time, where there was a surplus of urea worldwide. In order to remain competitive, we had to produce urea fertilisers, which have both economic and ecological advantages – i.e. providing exactly what the farmers needed. We succeeded in this to a greater extent after 2005, when our new parent company Agrofert, and the management of SKW Piesteritz, allocated the area of research and development significantly higher importance in the company. We then brought innovative fertiliser products onto the market, step by step, which ensure that nitrogen in its various compounds, is better for the plants and significantly reduces environmental damage, due to nitrification and urease inhibitors amongst other things. Since 2005, Piesteritz has developed into a significant location for industrial research in Saxony Anhalt. At the end of the 1990s, many companies strove to start spin-off companies for research and development. You not only resisted this, but also argued that in addition to the R&D department of SKW Piesteritz, an agricultural chemistry An-Institut e.V. (AIP) should be founded at the Martin Luther University Halle-Wittenberg. What did this achieve? With the Secretary of State at the time – Dr. Reiner Haseloff – we discussed the possibilities of promoting research as effectively as possible, in the sense of our state. A result was the foundation of the An-Institute, which has now funded 20 doctoral theses – 12 of which have already led to the conferral of doctorate. The transformation of foundation research, which is practised in the universities and institutes in the state, into application related research by companies, is crucial to ensure jobs in the state. Piesteritz is definitely an innovator here. With the An-Institut, our relationships and those of other companies with universities, and universities of applied sciences, took on a new quality. Today, more and more people in Germany want agricultural organic products, which are produced without the use of fertilisers and pesticides. What future do you see for innovative fertilisers? The wishes are understandable, but in light of the continually growing global population, organic farming cannot replace modern agriculture. For example, ecological agriculture requires large quantities of cropland. At the same time, the demand for agricultural products such as rapeseed oil is growing, which is needed for the production of biofuels and further raw materials. Therefore, the production of fertiliser products remains irreplaceable, to continue to supply mankind. You are still in the company two days a week, when you lead a special research area. What are you working on? I am trying to introduce the knowledge from my experience, and indeed both in the optimisation of chemical processes, and in the development of active ingredients for plant nutrition. In addition, coordinating the interaction of industrial and academic research.